1. Preheat the grill to high (240˚C). Meanwhile, in a heavy frying pan, dry-toast the pine nuts until just golden. Lightly toast the sourdough, top with the goats’ cheese and place under the hot grill for 1 minute. 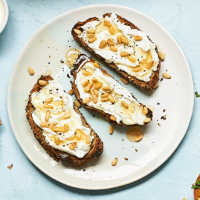 Scatter with the pine nuts and drizzle with the honey. Season with black pepper before serving.